Hi everyone. 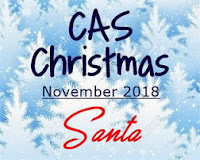 Another couple of cards for the CAS Christmas November Challenge - Santa. Here he is with a little wrapped gift for someone special. Don't you just love the multi-coloured polka-dot background. I think it's adorable and perfect with this Santa. Received these adorable stamped and die-cut images from my dear friend Bonnie. Just did a quick watercolour with distress inks and zigs. Then added a bit of blush to his cheeks with red chalk and crystal glaze with diamond dust glitter on top for the brim and pompom. Still a few days to play along with the challenge before it closes at midnight on Nov. 24th. Hope to see you in the gallery! Adorable Santas! How fun someone gifted these to you :) -- cute cards you made with them too. Such cute Santas! Love them peeking out of the apertures with the fun coloured dots behind (always a good feeling to use up some dp!). You have done these Santa's up in such a fun way, Loll! Love those polka dots and even the sentiment ink and message says FUN! These Santas are the cutest thing and love how you colored him. They look so fun to do too! Against that fun background he looks terrific. Love the bright colors on the packages too. Another image for the wish list. Very cute Santa cards! And, love the colorful polka dots! Loll, these Santa's are so sweet and love the DP background. love your santa's peeking out the windows with the pattern paper behind, looks wonderful. Lucky you getting them gifted to you. Enjoy them, I have just been colouring mine up as I couldnt resist buying them any more. I have so many Santa's, maybe I need to do a Santa convention lol. Super cute cards Loll - love how you have made the most of the santa image by 'framing' him! You have some very generous friends, Loll! What adorable cards. Those Santas sure make me smile. I adore the polka dot background and the use of the stitched rectangle cut out frame die. These are terrific!! Love these adorable Santas! Darling cards! These Santas are so adorable, Loll! I love both cards. The multi-colored polka-dot background makes the scene so fun and festive. Fantastic choice of the patterned paper. Love your color choice of the sentiment too. It echos the background (and the gift box). Both you and Santa look like you've had a lot of fun x. Fabulous Christmas cards and love the image and the fun polka dot backgrounds x. Beautiful watercoloring on your Santa's and I love the multi-colored polka dots for the background! Really cute cards, Loll! love the fun and festive look these have Loll, too cute. I bought that digi yrs ago before it was a stamp...I need to retrieve it. This stamp set is really beautiful. I love the modern line of these projects. I love how you managed these sweet Santas characters. Twelve Tags of Christmas --- Wrap-up!